Veteran metal/rock journalist, Ramón "Oscuro" Martos, has finally published his eagerly awaited metal art book, ...AND JUSTICE FOR ART: STORIES ABOUT HEAVY METAL ALBUM COVERS - VOLUME 2. This one-of-a-kind collection of graphics and stories reveals all the particulars behind the making of now-legendary album art including SLAYER's Hell Awaits, JUDAS PRIEST's Screaming For Vengeance, MORBID ANGEL's Altars Of Madness, METALLICA's Death Magnetic, BLACK SABBATH's Heaven And Hell, QUEENSRYCHE's Operation: Mindcrime, EMPEROR's In The Nightside Eclipse, DEATH's The Sound Of Perseverance, TYPE O NEGATIVE's Bloody Kisses, CARCASS' Surgical Steel, AMORPHIS' Tales From The Thousand Lakes, SOULFLY's Archangel, BEHEMOTH's The Satanist, OPETH's Sorceress, and many others. The stories behind these iconic works are told through more than one-hundred exclusive interviews with metal icons like Max Cavalera (Soulfly), Jeff Walker (Carcass), Dave Lombardo (ex-Slayer), K.K. Downing (ex-Judas Priest), Satyr (Satyricon), David Vincent (ex-Morbid Angel), Hansi Kürsch (Blind Guardian), Luc Lemay (Gorguts), Ihsahn (Emperor), Paul Mazurkiewicz (Cannibal Corpse), Jamey Jasta (Hatebreed), and so many more. Additionally, the collection features insightful interviews with legendary illustrators such as Eliran Kantor, Dan Seagrave, Travis Smith, Valnoir, and Costin Chioreanu, who also designed the book's stunning front cover. "This new book features 252 color pages and more than 400 images. It provides firsthand information about hundreds of graphics, which are presented in extremely high quality," Ramon Oscuro comments. "Although this is a direct continuation of the first volume published in 2015, it's also a true standalone book. Readers will be able to discover images and stories that haven't been published until now. This volume is the product of three years of intense work and insightful research. Working on it was an amazing experience." Several musicians have expressed their enthusiasm for the ...AND JUSTICE FOR ART book series. SOULFLY's Max Cavalera -- who penned the new book's foreword -- has thanked the author, "for helping to keep alive the ritual of the album cover." VLTIMAS/ex-MORBID ANGEL frontman, David Vincent crowned ...AND JUSTICE FOR ART, "a historical document about the importance of metal album covers." CATTLE DECAPITATION vocalist Travis Ryan proclaims, "this is exactly what the music world needs to remind us how important album covers have been to all of us that grew up surrounding ourselves with physical media." 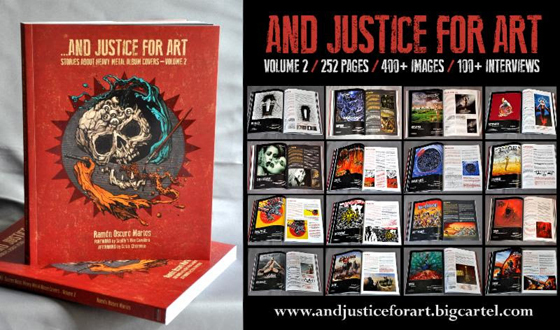 ...AND JUSTICE FOR ART - VOLUME 2 was funded through a successful crowdfunding campaign launched by Oscuro via Indiegogo. The current edition is limited to 300 copies and is exclusively available at THIS LOCATION. Each copy is personally signed by the author. View the book's teaser video below. English. 252 Color Pages. 400+ Images. 100+ Interviews.